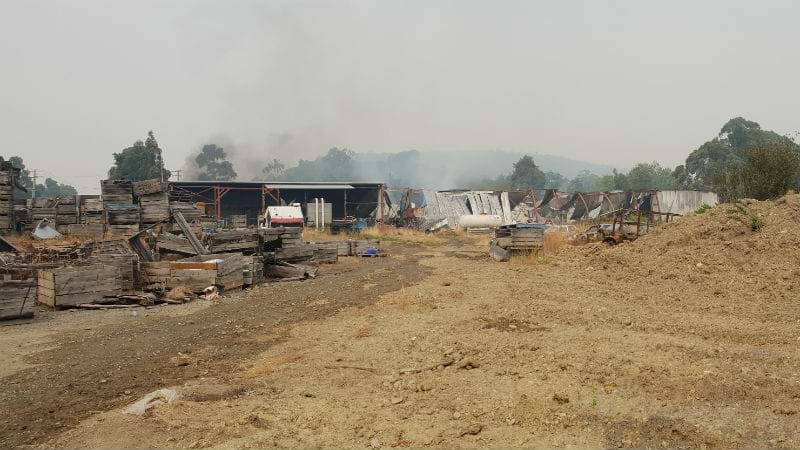 TFS fire investigators have been on the scene of a fire that destroyed the only remaining working apple packing shed in the Channel area this morning. Crews were called to Groombridge’s apple packing shed to find the 80 x 50m facility well alight and it took 4 at least hours to bring it under control. Firefighting was difficult due to oxyacetylene and LPG cylinders, requiring crews to pull back from the fire at certain stages. Five volunteer crews from across the Channel area attended the fire. A waterbombing helicopter is currently being used to completely extinguish the fire so it can be deemed safe to be left unattended and allow ground crews to focus on the bushfire response. The fire was caused by an electrical fault in the mains switch of the switchboard in the engine room. The estimated damage is $2.5million including produce, plant and equipment.